Not to be confused with Panama–California Exposition. The Panama–Pacific International Exposition (PPIE) was a world's fair held in San Francisco, California, U.S., from February 20 to December 4, 1915. Its stated purpose was to celebrate the completion of the Panama Canal, but it was widely seen in the city as an opportunity to showcase its recovery from the 1906 earthquake. The fair was constructed on a 636 acre (2.6 km2) site along the northern shore, between the Presidio and Fort Mason, now known as the Marina District. Among the exhibits at the Exposition was the C. P. Huntington, the first steam locomotive purchased by Southern Pacific Railroad; the locomotive then went on static display at the California State Railroad Museum in Sacramento. A telephone line was also established to New York City so people across the continent could hear the Pacific Ocean. The Liberty Bell traveled by train on a nationwide tour from Philadelphia, Pennsylvania, to attend the exposition. The 1915 American Grand Prize and Vanderbilt Cup auto races were held February 27 and March 6 on a 3.84-mile (6.18 km) circuit set up around the Exposition grounds. The Smithsonian Institution also had an exhibition at the Exposition. The centerpiece was the Tower of Jewels, which rose to 435 feet and was covered with over 100,000 cut glass Novagems. The ​3⁄4 to 2 inch colored "gems" sparkled in sunlight throughout the day and were illuminated by over 50 powerful electrical searchlights at night. In front of the Tower, the Fountain of Energy flowed at the center of the South Gardens, flanked by the Palace of Horticulture on the west and the Festival Hall to the east. The arch of the Tower served as the gateway to the Court of the Universe, leading to the Court of the Four Seasons to the west and the Court of Abundance to the east. These courts formed the primary exhibit area for the fair, which included the Food Products Palace, the Education and Social Economy Palace, the Agriculture Palace, the Liberal Arts Palace, the Transportation Palace, the Manufacturers Palace, the Mines and Metallurgy Palace, and the Varied Industries Palace. The Machinery Palace, the largest hall, dominated the east end of the central court. At the west end of central court group was the Palace of Fine Arts. Further west toward the bay down The Avenue of the Nations were national and states' buildings, displaying customs and products unique to the area represented. At the opposite end of the Fair, near Fort Mason was "The Zone", an avenue of popular amusements and concessions stands. Constructed from temporary materials (primarily staff, a combination of plaster and burlap fiber), almost all the fair's various buildings and attractions were pulled down in late 1915. Intended to fall into pieces at the close of the fair (reportedly because the architect believed every great city needed ruins), the only surviving building on the Exposition grounds, Bernard Maybeck's Palace of Fine Arts, remained in place, slowly falling into disrepair (although the hall used to display painting and sculpture during the Fair was repurposed as a garage for jeeps during World War II). The Palace, including the colonnade with its signature weeping women and rotunda dome, was completely reconstructed in the 1960s and a seismic retrofit was completed in early 2009. The Exploratorium, an interactive science museum, occupied the northern 2/3 of the Palace from 1969 to 2013; the city-owned Palace of Fine Arts Theater, has occupied the southern 1/3 since 1970. A panorama of the Palace of Fine Arts c.1919. The current building was rebuilt in the 1960s, and then seismically retrofitted after damage from 1989's Loma Prieta earthquake, and again in 2009. Buildings from the Exposition that still stand today (other than the Palace of Fine Arts) include what is now called the Bill Graham Civic Auditorium at Civic Center Plaza and the Japanese Tea house, which was barged down the Bay to Belmont, California and currently operates as a restaurant. Also surviving are the one-third scale steam locomotives of the Overfair Railroad that operated at the Exposition. They are maintained in working order at the Swanton Pacific Railroad Society located on Cal Poly San Luis Obispo's Swanton Ranch just north of Santa Cruz. The Legion of Honor Museum, in Lincoln Park, was the gift of Alma de Bretteville Spreckels, wife of the sugar magnate and thoroughbred racehorse owner/breeder Adolph B. Spreckels. The building is a full-scale replica of the French Pavilion from the 1915 Panama Pacific International Exposition, which in turn was a three-quarter-scale version of the Palais de la Légion d'Honneur also known as the Hôtel de Salm in Paris by George Applegarth and H. Guillaume. At the close of the exposition, the French government granted Spreckels permission to construct a permanent replica of the French Pavilion, but World War I delayed the groundbreaking until 1921. The US Post Office issued a set of four postage stamps to commemorate the exposition, with designs depicting a profile of Vasco Núñez de Balboa (1¢), the Pedro Miguel Locks of the Panama Canal (2¢), the Golden Gate (5¢), and the discovery of San Francisco Bay (10¢). The stamps were first put on sale in 1913, to promote the coming event, and perforated 12, and then reissued in 1914 and 1915, perforated 10. Their prices today range widely; the 2¢ of 1913 is available for under a dollar in used condition, while an unused 10¢ of the scarcer orange-yellow variety in 1915 can be worth up to a thousand United States dollars. The United States Congress authorized the San Francisco Mint (also known as "The Granite Lady") to issue a series of five commemorative coins. Said coins were the 1915-S silver Panama-Pacific half dollar and four gold coins. The denominations of the gold coins were $1, $​2 1⁄2 (quarter eagle) and $50 (in two types: a round coin, and an unusual octagonal coin). The Panama-Pacific coins have the distinction of being the first commemorative coins to bear the motto "In God We Trust", and were also the first commemoratives to be struck at a branch mint. The two lower denomination gold coins are scarce, while the two $50 ones are extremely rare. The silver half dollar had a mintage of 27,134 and in modestly worn condition is available for several hundred dollars. Numismatist Farran Zerbe supervised the creation of a series of commemorative medals, an award medal, a souvenir medal, and diplomas. In 2015, the California Historical Society, the Maybeck Foundation, and Innovation Hangar will partner with the City and County of San Francisco to commemorate the centennial of the transformative 1915 Panama Pacific International Exposition. On June 20, 2015 a commemorative orchestra, chorus and band concert was held at the Palace of Fine Arts to celebrate the 100th anniversary of the fair. A feature film, When the World Came to San Francisco, which tells the story of the fair, was made by writer and director R. Christian Anderson. It was part of the city's official centennial celebration sanctioned by the California Historical Society. The film had its world premiere at the de Young Fine Arts Museum in Golden Gate Park on October 30, 2015. The "India Block" at the Exposition. Aerial view of the Panama–Pacific International Exposition. The exposition buildings have been colored to distinguish them from the rest of the Marina District area. ^ Nye, Doug (1978). The United States Grand Prix and Grand Prize Races, 1908-1977. Garden City, NY: Doubleday. pp. 32–33. ISBN 978-0-385-14203-8. ^ "Brochure for the Panama-Pacific International Exposition". Smithsonian Institution Archives. Retrieved 25 May 2012. ^ McCoy, Esther (1960). Five California Architects. New York: Reinhold Publishing Corporation. p. 6. ASIN B000I3Z52W. ^ "Swanton Pacific Railroad Society". ^ "Swanton Pacific Railroad Facebook Page". ^ "About ArtPoint". Archived from the original on 2008-06-25. Retrieved 2008-12-12. ^ "History of the Legion of Honor | Legion of Honor". ^ "Auction Sale 1040 — Outstanding United States Stamps". ^ "1915 Panama Pacific Exposition Coinage". www.pdxcoinclub.org. ^ "Panama-Pacific Expo 5 Coin Set on exhibit at Santa Clara Expo : Coin Collecting News". www.coinlink.com. Retrieved 2017-06-05. ^ "Home - Panama-Pacific International Exposition". 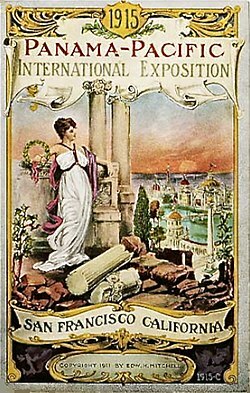 Panama-Pacific International Exposition. Laura A. Ackley, "San Francisco's Jewel City: The Panama-Pacific International Exposition of 1915." Berkeley, CA: Heyday, 2014. Lee Bruno, "Panorama: Tales from San Francisco's 1915 Pan-Pacific International Exposition." Petaluma, CA: Cameron+Company, 2014. Abigail M. Markwyn, "Empress San Francisco: The Pacific Rim, the Great West, and California at the Panama-Pacific International Exposition." Lincoln, NE: University of Nebraska Press, 2014. Sarah J. Moore, Empire on Display: San Francisco's Panama-Pacific International Exposition of 1915. Norman, OK: University of Oklahoma Press, 2013. Wikimedia Commons has media related to Panama-Pacific International Exposition. The Panama-Pacific International Exposition at San Francisco, 1915 (1915). From Internet Archive. Panama-Pacific International Exposition AND mediatype:movies From Internet Archive.